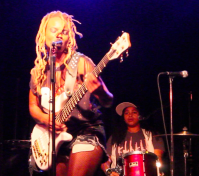 Divinity Roxx Belgium TV, Black Girls Rock 2013 and more! Greetingz all you ROXX STARS and Groove Guests,Hope this newsletter finds you well, living your dreams, and of course Roxxin in your own way. Its been a crazy month. If you peeped me on IG: (diviroxx) or heard the little bluebird chirp, (@diviroxx), then you’ve rolled with me to NYC, LAX, off to Germany and back again.I can’t sit in one place for too long so we’re heading off to spread some of this energy to my home away from home, Belgium, then off to France then back to NYC to play the tv show ‘Black Girls Rock’.You down to roll? Good. Lets Go. Oh yeah, and LIKE my FB Page, please! 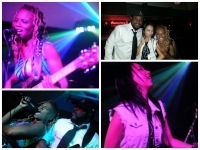 Had a blast playing with the homie Nikki Glaspie and friends in NYC for the Women Who Jam Show. Saw a bunch of my NYC heads I hadn’t seen in a while and introduced the Roxx Boxx Experience to some new fans too! Next time I’m performing in the city, be sure to stop by and Holla atcha girl! The Good Hurt show packed a powerful punch as Los Angeles was hit with a Quake beyond what the Richter Scale could measure. The energy was phenomenal and the crowd was amazing. Thanx to all the friends, fans, curious onlookers, and haphazard walk-ups that came and experienced that magical moment with me. The band was killin’ (Jinjoo on guitar, Larry Belton, Jr, on drums ) and Malcolm Jamal Warner sat in and rocked ‘Killin in the Name Of’ on bass with us. We only have a little bit of footage from the fans on Instagram. Click the pic to see Malcolm rip! Its pretty incredible to be a part of a company that just gets it. Warwick Bass Guitars is THAT company. Who else can pull off an event so big and filled to the brim with the most legendary bass players (Victor Wooten, Alphonso Johnson, Leeland Sklar, John Pattitucci, Stu Ham, & Stuart Zender, just to name a few), and bring this community together in the middle of no where in Germany complete with first class accommodations and a music festival type atmosphere. If you don’t know who these guys are, I suggest you Google them and prepare for a jaw-dropping experience as you realize that these guys have been responsible for some of the most prolific bass we’ve experienced live and on major recordings in the past 20 or so years. Add to that a bunch of bass students eager to learn from the best plus the Factory we refer to as the ‘Willy Wonka Bass Factory’ (an eco friendly environment) complete with food, plenty of German beer, fireworks, and nightly jams. I am a fan first and being around it all just makes for a giddy little divinity who remembers what it was like when I first picked up the bass. I loved it then. I love it now. And I love being one of the lucky musicians to have the support of such an incredible family run company. Click the pic to check out some of the fun. Belgium, my home away from home with my brothers from other mothers! We have so much fun playing together. Can’t wait to see and play with Babl, Patrick and Remi! Miss you guys! I’m also looking forward to playing this new television show, Nuff Said in Belgium which features an array of performers and guests. Its also always great to play The Charlatan and Cafe Shuttershoff (they like to dance). I was really looking forward to playing the Boogie Woogie but the owner is having a major surgery. Send a little healing energy his way. That place really rocks and he really supports good live music. We’re still working on a couple of additional dates but for now here’s the list of what we’ve confirmed. I’m also really excited to play Black Girls Rock this year in NYC wich airs Oct 26th in the US. Be on the look out for them blonde dreds flyin all over the place. 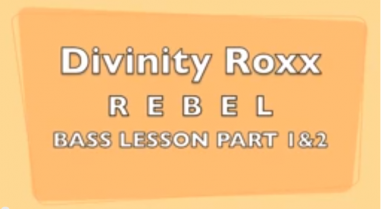 I heard you loud and clear, and you want me to give you the Rebel Lesson. Well, here it is. Part I and II. I’m gonna be honest with you. I’ve never done this before and its really funny watching myself give a lesson. The Lesson is in three parts and in the last lesson I’ll give you the lyrics and the rhyme so you can really play the whole song. I tried to be as thorough as I could in the explanation without being too boring…. Hit me up and let me know what you think about the format by replying to this newsletter. 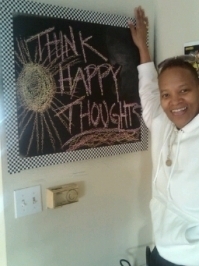 Ma Roxx offers Words of Wisdom for September. It happens to be her B-DAY month and these words are definitely in line with everything she’s taught me. We must continue to seek our passion to become whole and free. you are doing the impossible :).You got down with that one Ma. Copyright © 2013 iRoxx Ent, All rights reserved.